The total gross revenue collection through Goods and Service Tax in the month of November has amounted to Rs 97,637 crore. It was Rs 100,710 crore in October. Thus there is a drop of 3,073 crore in GST revenue collection in November with respect to the previous month. As per a release from the finance Ministry of the Central government, GST revenue collection for the month of November has been Rs97, 637 crore of which CGST is Rs 16,812crore SGST is Rs23, 070 crore and IGST is Rs 49,726 crore. Besides, collection from Cess happens to be Rs 8031crore. As many as 69.9 GSTR 3B returns have been filed for transactions in October till November 30. The release mentions, the government has settled Rs. 18,262 crore to CGST and Rs. 15,704 crore to SGST from IGST as regular settlement. The total revenue earned by Central Government and the State Governments after regular settlement in the month of November, 2018 is Rs. 35,073 crore for CGST and Rs. 38,774 crore for the SGST. Rs. 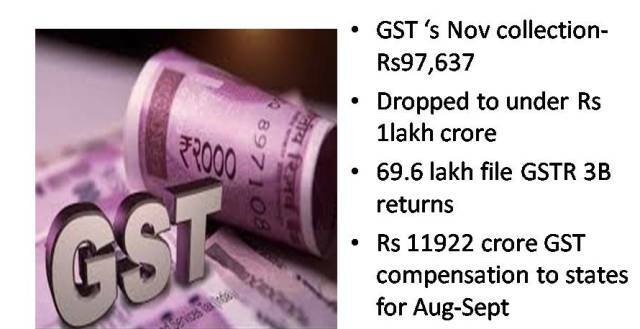 11,922crore has been released to the states as GST compensation for the months of August-September, 2018. 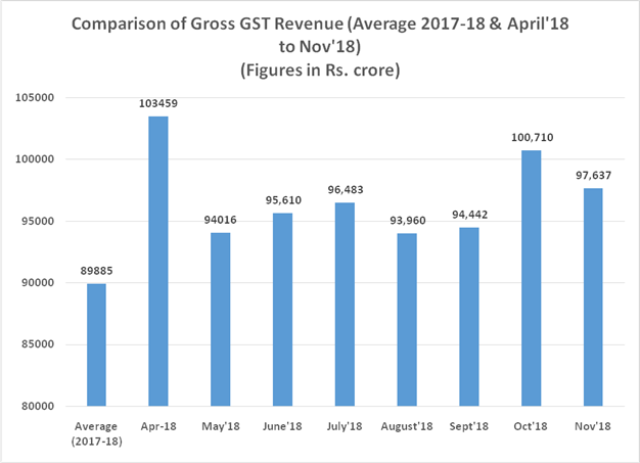 GST collection in November has come down to under Rs 1 lakh crore stimulating observations from the economic observers yet the Rs 97 thousand crore collection of November is better than each single month collections between April and October, the only two months in the current financial year those have crossed Rs 1 lakh crore mark.